A silver stainless steel case surrounds the white dial featuring silver hour, minute, and second hands. Sparkling crystals mark the hours, while the quarter hour positions are marked by silver indexes and Roman numerals. A window near the 3 o'clock position displays the the date. A mineral crystal protects the dial. 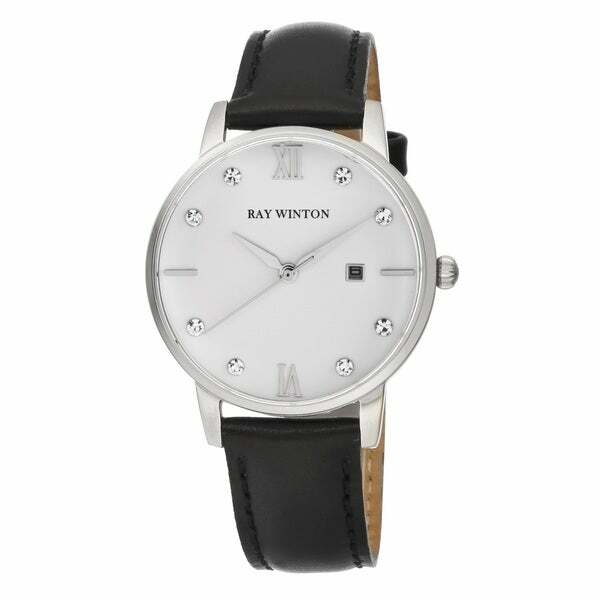 The black genuine leather strap fastens securely with a pin buckle. A reliable Japanese quartz movement keeps time. This watch is water resistant at 3 ATM.All measurements are approximate and may vary slightly from the listed dimensions. Women's watch bands can be sized to fit 6.5-inch to 7.5-inch wrists. Dimensions Case: diameter 34mm thickness 7mm. Band: width 16mm length 6.75in.